This chart illustrates the make up of calls members of the Oceanport Volunteer First Aid Squad were requested within the year. BLS medical calls represent emergencies without the request for paramedics, while ALS represents the calls where paramedics were requested or automatically dispatched. MVAs represent motor vehicle accidents. Mutual aid represents requests for mutual aid out to other towns. 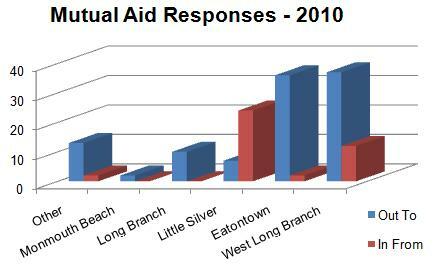 This chart shows the mutual aid responses to neighboring communities. In the event that a First Aid Squad is unable to get adequate manpower to answer a call, it is forwarded to neighboring squads for coverage. Orange represents times Oceanport was requested to other Municipalities. Blue represents the times other squads were requested into Oceanport to cover calls for us. 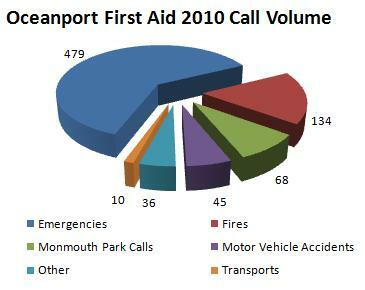 This chart illustrates the make up of calls members of the Oceanport Volunteer First Aid Squad answered within the Borough for the year 2011. 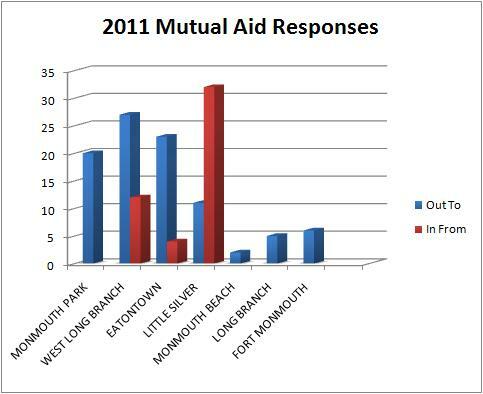 This chart shows the mutual aid responses to neighboring communities. In the event that a First Aid Squad is unable to get adequate manpower to answer a call it is forwarded to other squads for coverage. Blue represents times Oceanport responded to other Municipalities. Red represents the times other Squads responded into Oceanport to cover calls for us. 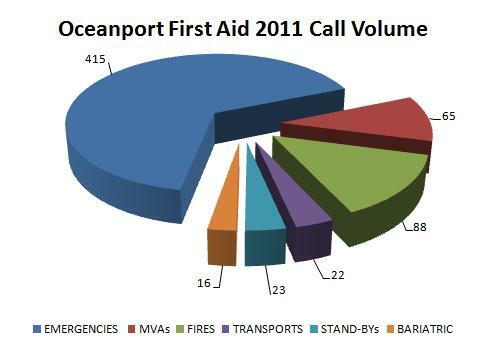 This chart illustrates the make up of calls members of the Oceanport Volunteer First Aid Squad answered within the Borough for the year 2010.